Here’s another one for the date night mini-series. Have you ever wanted to go to Italy? Yeah, me too. However, the statement “We’re going to take a vacation to Italy” is about as accurate as “I love to scrub tile floors with a toothbrush.” Maybe one day I’ll get there, but it won’t be anytime soon. Unless it’s for Date Night. 1) Decide what you want to do on your date. Think Italian themed. Movies, food, activities, ect. What jumps to mind when I say “Italy”? Make a list and then start planning. 2) Set up. Make sure you have all the ingredients for dinner. Especially if the main ingredient is “reservations”. Hehehe. It’s up to you whether you want to have it prepared beforehand or if you want to cook it up together. Look for simple, easy and frugal decor to help set the mood for your evening. Foam board columns might add just the right touch. You get out of romance what you give. The Dollar Store is a great place to start. 3) Tell your sweetie about it. Even if you don’t spill the beans about taking an Italian Holiday, make sure your honey knows that you have made plans for the two of you and that they need to be on time. 4) Get everything all set up. Whether it’s getting the prep for dinner done, donning a costume, setting up your home theater for a movie. Have everything ready. New sheets on the bed is always a good start to date night prep. I have a digital version of the Italian Holiday Date Kit available. If you’re interested in it, let me know and I’ll make you a custom listing in my Etsy Shoppe. Everything is all planned out for you already. Plane tickets, Invite/Reminder Card, Detailed Instructions and a fun activity are all included. 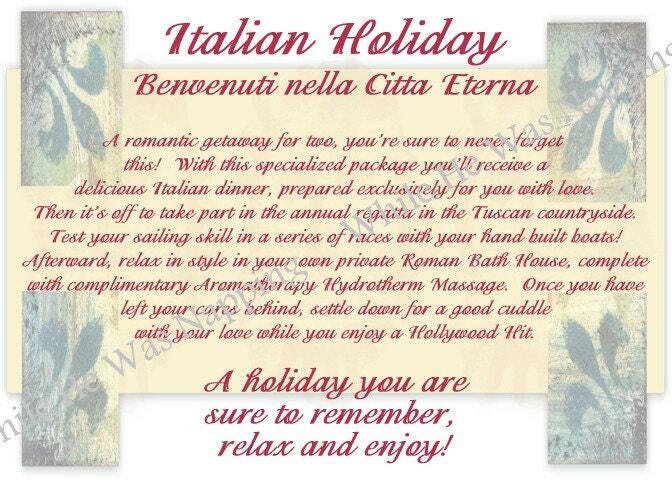 If you are interested in a physical Date Kit with the Italian Holiday theme, let me know. I’ll get you all hooked up. I’m also willing to do destination date request kits, if you’re looking for something special for Valentine’s Day. Let me know where you’d like to go. I´ve just found your blog and i love it!! I liked the idea of this post. You have a new follower from now. I love your idea! That is awesome, it gave me a great idea for my husband’s birthday! Thanks!